Low Calorie Pizza. It’s a thing. Spring has finally sprung! That means the flowers are blooming, the weather is perfect, and my birthday is mere weeks away. It also means that Summer is also mere weeks away and this is L.A., so we all have to start prepping our beach bodies (even if we don’t go to the beach because traffic is terrible, and who wants to spend an hour driving to the beach, and another hour parking, on a weekend?). Okay so maybe we don’t all need beach bodies, but we also don’t need pizza every day, even though we wish we could sometimes. I mean, it’s the world’s perfect food, right? But I was doing some Pinterest-ing the other day and saw some recipes for a pizza crust made of cauliflower. What! Cauliflower! I’ve been kind of obsessed with cauliflower lately as a low-calorie potato substitute, but could it possibly sub in for my beloved pizza crust? It starts with taking some cauliflower and pulsing it in a food processor until it’s chopped into a fine powder. Sidenote: At this point you could use it as a substitute for rice! So many options for a simple vegetable! Now you have to get as much water as possible out of the cauliflower so that you can get a crispy crust. So microwave it for a few minutes and then lay it on a kitchen towel to cool. When it’s cool enough, wrap the towel around and squeeeeeeeze until you get as much water out as possible. It will be a surprising amount. You’ll be left with these dry cauliflower crumbles. In a bowl, mix the cauliflower with 1/4 cup parmesan, 1/4 cup mozzarella, 1/2 a teaspoon each of dried basil and dried oregano, along with 1/4 teaspoon of salt and a few red chili flakes. Oh and most importantly, one egg! Mix it all together and lay it on parchment paper. Form into a pizza-like shape. This is the best because you don’t need to roll out dough. I’m terrible at rolling out dough. You bake it in the oven for 10 minutes until it’s nice and golden brown. A pizza! Look you can even slice it! I love trying new places to eat, especially fast-casual types. You know, the ones where you can order the kind of food you might make at home, but without all the mess of actually cooking at home. Let that marinate for an hour or so, so the flavor really seeps in. While that’s happening, you can get your spinach ready. I used frozen spinach and mixed it with feta cheese, olive oil, and salt & pepper. I also took the time to roast some potatoes, because why not? It was just some olive oil, salt, pepper, and oregano. And garlic salt. Just a touch. These aren’t even cooked and they look delicious. Ok so now an hour has gone by and you’re ready to make the chicken. Heat up a grill pan, take the chicken out of the marinade, shaking of the excess, and get grilling! When it’s cooked on one side, flip it. Now let’s add the spinach. At this point make sure that you try to get it on the actual kitchen, because as I found out, spinach can get real smokey. Like, had to open all the windows, turn on the fan, that kind of smokey. Whoops! Now the tricky part here, is flipping it, because you want to get that spinach and cheese melted too. So after the chicken is cooked you very carefully flip it back over so that the spinach is on the grill. There might be a better way to do this, I suppose you could put the spinach directly on the grill and then lay the chicken on top, but that’s not as fun. After a minute, use a spatula to grab the chicken and flip it spinach side up. Didn’t lose a bit of that spinach! 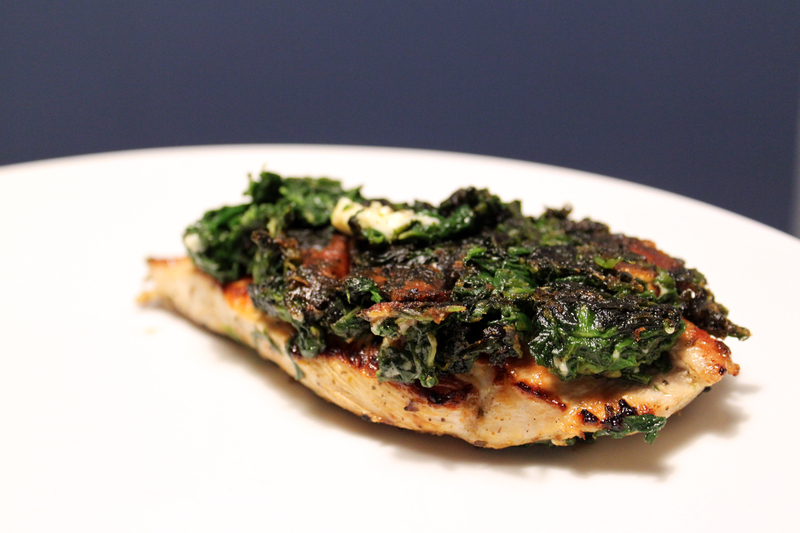 Now you have some slightly charred spinach and cheese, on top of perfectly grilled chicken. If you want, make a greek salad to go with it, and serve it up with those potatoes. Look at all those greens! It’s a healthy meal, I think, but it was definitely big on flavor. And since it’s a billion degrees here in Los Angeles, I dined al fresco on the patio! Which had nothing to do with the fact that my apartment was full of smoke. 1. In a bowl, whisk the juice of 1 lemon, 1/2 cup olive oil, and 3/4 tsp oregano together. Season with salt and pepper. Add chicken and make sure it’s all covered in the marinade. Let sit for one hour. 2. Squeeze spinach in a kitchen towel to remove all excess water. Place in a bowl. Add the feta cheese, salt, pepper, and 1/4 cup olive oil. Mix together with a fork, breaking up any large clumps of spinach. 3. When the chicken is ready, heat a grill pan on medium high. Remove chicken from marinade, shaking off excess, and place on hot grill. Cook for 3-4 minutes, then turn over. 4. Cover the top of the chicken with spinach mixture. After 3 -4 minutes, flip chicken and spinach over. Be careful, the spinach might not be too stable! 5. Grill, spinach side down, for one minute. Remove to a plate, flipping it back, spinach side up! 6. Serve with roasted potatoes, and/or a Greek salad! I was at an event last night, you know, hobnobbing with the Hollywood elite. Or, you know, at least the people who work for the Hollywood elite. Or really, just the common folk while the Hollywood elite conversed among themselves. The point is, I was at a party on a Thursday! What a rebel. Anyway, I was talking to a very nice woman and she was telling me that her version of cooking is going to the prepared foods area at Whole Foods, which is not going to land her a man (her words!). I told her cooking is a lot easier than people think, you just need to know where to start and find some simple recipes that are big on flavor, enough to impress a man people. Once you have a few of those down, you’ll get more comfortable and want to try more adventurous things! Before you know it, you’ll never go to the Whole Foods prepared section again! And maybe you’ll land a man. Today’s recipe is one of those recipes that is delicious, simple, and impressive. It’s got a ton of flavor, you probably have most of the ingredients already, and, if you’re into it, it’s low carb! Something for everyone! It starts by combining flour with some spices in a paper bag. It’s like you’re own Shake-n-Bake! Then you coat each piece of chicken in that mix, and put it in a pan to brown. …and ends up like this! After the chicken is golden brown, remove it, and add in half & half, cooking sherry, and a lot of parmesan cheese to make a flavorful sauce. In a baking dish you layer the chicken on top of a bed of chopped broccoli, and top each piece with prosciutto. Pour the sauce over the whole thing, and add more parmesan! Never enough parmesan. Bake for 30-35 minutes until it’s perfectly done. Serve to guests who won’t understand how delicious it is until they take a bite and fall over in their chairs. You can use more or less chicken, you can cut the chicken breasts in half (so you have an excuse to use more prosciutto! ), it works either way. The chicken is perfect, the prosciutto is crispy, and the broccoli absorbs the flavors and cheese from the sauce. I encourage everyone to give it a try and report back. It’s super easy. And will definitely impress everyone who eats it! 2. In a paper bag, mix the flour, sage, oregano, and paprika. Add chicken breasts, one by one, and shake to coat. Like Shake-n-Bake! Shake off the excess,and place aside. 3. Melt butter in a pan over medium heat. Add chicken and cook until golden brown, about 3-4 minutes per side. Remove from pan. 4. Pour excess oil from the pan, and add half & half. Bring it to a light boil over high heat, stirring to scrape off the delicious brown bits from the bottom of the pan. 5. Add the sherry, boil for one minute. 6. Add all but 3 tablespoons of the parmesan cheese, and season with salt and pepper. Stir until cheese is melted. Remove the pan from heat. 7. Place chopped broccoli in a layer at the bottom of a baking dish, and place chicken on top. Cover each piece of chicken with a slice of prosciutto. 8. Pour sauce all over chicken and broccoli. Sprinkle remaining parmesan on top of each piece. 9. Bake in oven until the chicken is tender, and the sauce is bubbling. About 30-35 minutes. Serve hot! Happy Tuesday, everyone! Though, it’s a Tuesday after a holiday weekend so it feels like Monday, so, happy…Muesday? Today’s story involves pancakes. Not the sweet breakfast kind, but the savory, salty kind. But to understand how this came to be we have to go back in time. Way back…to, like, five months ago. That’s when I was lounging around watching Giada at Home and saw her recipe for Soccas with Kale and Raisins. I mostly wanted to make it because of how she said it. “SO-cahhhhh.” It involved garbanzo flour-based crepes wrapped around a savory filling. In theory, it looked great. In reality, I over-salted it and was bloated for days. Made correctly, I am sure it is delicious. But I was left with all this garbanzo flour and wanted to do something with it. Thankfully, it was Bon Appétit to the rescue! January’s issue had a recipe for Chickpea Pancakes with Leeks, Squash, and Yogurt, that looked positively mouth watering, and gave me a reason to use up this flour. You also need to grate a cup of squash, like butternut squash, but heeeelllll no I’m not going to do that by hand! That’s why I have a food processor! 10 seconds, and it’s done! Next you sauté the leeks and squash together for about 8 to 10 minutes so that the leeks are just browned, and the squash just cooked. While that’s cooling a bit, mix the garbanzo flour with an egg and some baking powder to make a simple batter. Finally, combine the veggies with the batter, and start frying it up! You cook them just like regular pancakes. When little bubbles form around the edges you can flip them and make sure they’re nice and browned. When they’re done, serve them with a dollop of plain yogurt, which helps to balance out the salty goodness with some cooling freshness. These are great as a main dish, or you could add some roasted vegetables onto it to make it more substantial of a meal, but either way, they’re a great, simple meal! Chickpea Pancakes with Leeks, Squash, and Yogurt from Bon Appétit.